Chinese discover a cave on the Moon! 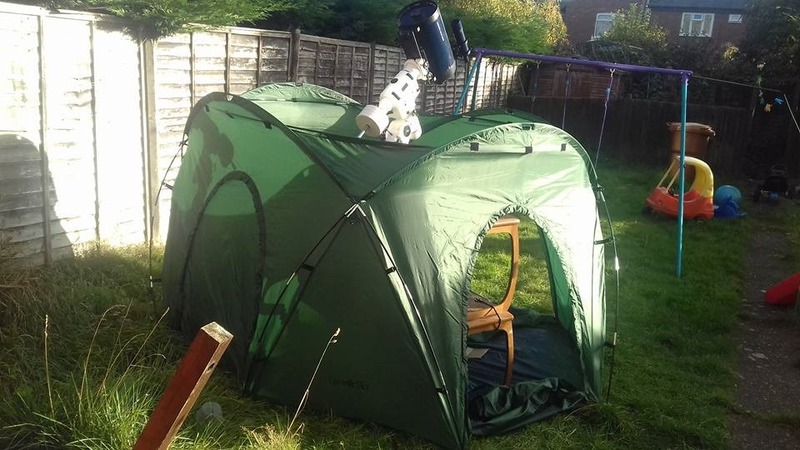 We are please to announce that Celestron have very kindly made a donation of one of the TravelScopes. Ideal for children, very portable and comes with its own back pack! Watch out for the competition where we will be giving this away!, coming VERY soon! For some years, i have enjoyed imaging using my Skywatcher NEQ6 and Meade Lx10 mounted on tripod. However a number of things were becoming clear. The sharp end of the legs start to sink into the group upsetting levelling. Also there were times i would like to move the setup to another part of the garden to capture something else in the night sky. In walked Matthew Armitage. Matthew has for sometime been pondering on a mobile pillar. For those who dont know, pillars are the more traditional setup for use in observatories. Usually permanent and concreted in. We rent so this is never going to happen. After sometime, and Matthew was very thorough in asking for measurements and other specs to ensure the build was spot on (he makes these bespoke!). 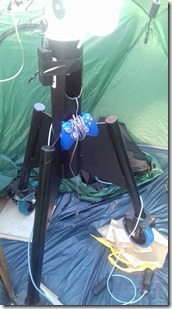 This was collected from the International Astronomy Show as we were both exhibiting there. It managed to fit in the boot of my Peugeot 307. 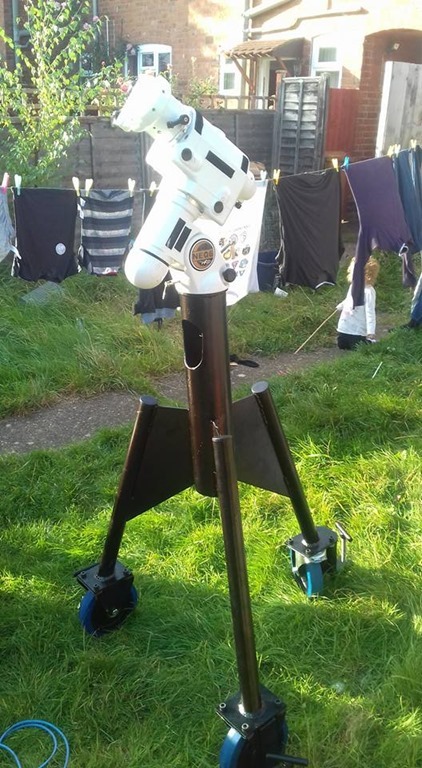 After re affixing the wheels* you can see now it sits proudly in the back garden with my NEQ6 mounted. I will say, you will need to use the bolt he supplies with this as i believe the original Skywatcher one is too small. Another plus with this, if you are ever so slightly off for polar alignment at least (in theory) the whole thing can be moved little to compensate, fortunately the only swivel wheel is North facing, so massive bonus there. 1. On this model only one wheel is swivel, the others are fixed, that said i think it is better that way, but something to bear in mind if you want to move it. 2. *Once home though, we did have the problem where it would neither fit down our side entrance or through the house. This might have been a show stopper but the wheels do come off. On this model at least they are fitted on with allen bolts and nuts. (defo consult with Matthew with this in mind if its to go through the house into the back garden. Those who have purchased this are those who operate out of garages and need to wheel the setup out. Amazing thing to be able to wheel it about as needed. For me though, this will remain outside. BUT i have something else which may help to keep it dry! Personally i am VERY optimistic by this new setup. I am not going to get rid of my tripod just yet though as i can see it will have uses if i go to a star party. Can i also at this point recommend Neil Ross’s covers, he makes these bespoke and i think would compliment this setup nicely! I am also excited about the levelling bolts on each leg, although it might have been a slight improvement to the setup if a pad had been fitted to the ends of these otherwise they will just dig in when in use. Easy to work around though. Now all i need are some clear days to properly try this! Can’t wait!